Many of the most beautiful cycle paths run along river valleys flanked by mountains and hills. 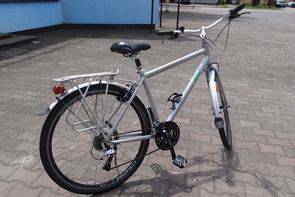 These rides, parallel to foaming river waters, are gentle and pleasant and it is not surprising that every year thousands of cyclists follow cycle routes along the Mosel, the Rhine or the Danube. Similar routes can be found in other Alpine countries as well - but are there any in Poland? The answer to that is a resounding 'Yes!' One of these rides follows a spectacular route along the river Dunajec, from Podhale (the plateau at the foot of the High Tatras) to the towns of Stary Sacz and Nowy Sacz - an adventure you can now experience for yourself. Bikes are selected at our cycle hire centre in the middle of the Old Town our tour of Krakow, a former capital of Poland gets underway. The city that was once the residence of Polish kings is on the UNESCO World Heritage list and boasts a historic architecture which came through the Second World War unscathed. Among Krakow's most important architectural treasures are St Mary's Church with the world-famous altarpiece carved by Veit Stoss; medieval buildings of Jagiellonian University, Poland's oldest university; Wawel Cathedral adjacent to the 11th century Wawel Castle; Europe's largest medieval town square; Kazimierz, the former Jewish quarter; the promenade along the Vistula at the foot of Wawel Castle. On our cycle tour we visit the 'Planty', attractive gardens laid out around the Old Town on the site of the earlier medieval city walls. At about midday a minibus takes us to Podhale. Our destination is the village of Zab, Poland's highest village. The journey takes about 2 hours. The first ride will be to Gubalowka, from where we can enjoy a panoramic view of the High Tatras. We then cycle down the mountain, past farm carts laden with hay. After a short rest at the point where the Poroniec and Zakopianka streams join the White Dunajec, we ride through the village of Olcza to Zakopane. Our accommodation here is not far from Krupowki, Zakopane's main street, a pedestrian area lined with lively cafés and shops. Zakopane has developed a very distinctive cultural character. The folk culture of the people who live in the Tatras, the Gorale, has been preserved in their music, their songs and their local costume. And the characteristic 'Zakopane style'of timber architecture, which developed around the turn of the twentieth century, can be found nowhere else in Europe. During our break we can sample 'œoscypek', the delicious smoked ewe's-milk cheese made in the Goral houses here. We take the cable car back to the top of Gubalowka and then cycle down through the village of Dzianisz as far as Chocholow, a village which is now a 'living open-air museum' of timber architecture, where we have lunch in the village inn. Following a short climb we enter the valley of Cichy Potok 'the quiet stream') and continue further downhill along a quiet path, through Ciche, Stare Bystre, Ludzmierz (with a famous Marian pilgrimage shrine), to the town of Nowy Targ, the main town of the Gorale mountain people. We spend the night in a stylish hotel located on the green outskirts of the town. This is the most spectacular day of the tour. We follow the river through Sromowce, a village once famous for the flocks of geese that used to be bred here. Soon, at about midday, we cross the border into Slovakia on the newly built bridge for pedestrians and cyclists. After cycling to the village of Cerveny Klastor (Red Monastery), above which rise the three peaks of Trzy Korony (Three Crowns), the highest point in the Pieniny range, we have a meal and visit the local museum. 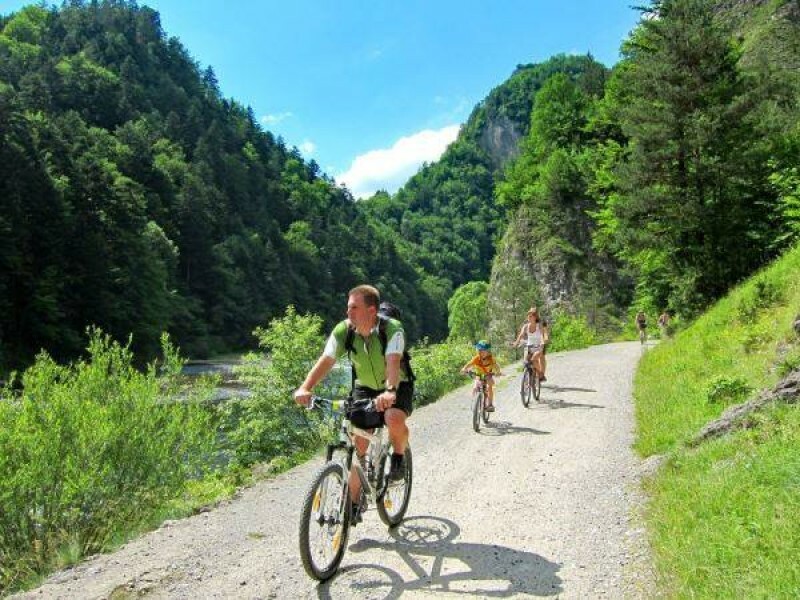 We then cycle along the 'Pieniny Way' a narrow ledge open only to walkers and cyclists, carved out of breathtaking limestone cliffs that run the entire length of the Dunajec Gorge. Unlike the tourists on wooden rafts being steered down the river by Gorale we can stop at any time to take photographs or even to bathe in the river. Also very beautiful is the gorge of the Lesnicky Potok, a stream which flows into the Dunajec from the Slovakian side, passing through the sleepy village of Lesnica. You can do a little shopping here before it's time to head back into Poland. The little spa town of Szczawnica is a pleasant surprise, with its cycle-friendly separate lanes for cyclists. In the afternoon we ride along the elegant promenade in the valley of the Grajcarek and explore the paths in the upper and lower spa gardens. The stretch today leads us through what is known as the green Dunajec Gorge, where the river passes between two ranges of the Beskids. Although there are no limestone cliff walls here, the slopes with their beech woods are still very impressive. We soon leave the main road, crossing the river on a suspension bridge to the right bank and making our way between the paths among the farms of the village of Tylmanowa with glimpses of the old barns, granaries and hen-houses though open doors. We stop for lunch at a guesthouse in Lacko, known for its strong slivovitz, a plum Bračdy. It is also possible to halt alongside fruit gardens on the valley slopes. At Golkowice we leave the Dunajec and ride to Rytro, an old feudal village at the foot of castle ruins. On our last evening we have a dinner with grilled trout fresh from the river. After breakfast we take a 10 km ride through the Poprad Valley to Stary Sacz. The morning is spent exploring this historic little town, one of the most beautiful in southern Poland, cycling through the maze of narrow streets for a feel of the atmosphere of past times. Then we continue (by bus) to the neighbouring town of Nowy Sacz, which still has something of the Habsburg Empire about it. The neo-gothic town hall in the attractive market square dates from that period and the streets are lined with well-restored art nouveau houses. From Nowy Sacz we return to Krakow (bus journey about 1.5 - 2 hours). Our accommodation for the last night is in the same hotel as on the first night, but we will spend the rest of the day in the quiet Kazimierz district, once the Jewish quarter of the city. An evening of Klezmer music brings the tour to a close. Departure or extend your stay in Krakow. We recommend flying to Krakow airport to reach the starting point of this cycling holiday. The hotel is located in the centre next to the old town and just opposite the city’s main railway station ‘Krakow Glowny’, please see enclosed map. • Getting there from the main railway station (Krakow Glowny) If your luggage is not too heavy you can get there on foot (10-15 minutes’ walk). 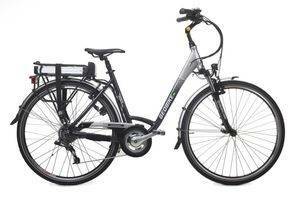 Otherwise, taxi is a good option (cost approximately 10zl = 2.5 GBP). If you do not have any zlotys you can find both currency exchanges and cash machines near the railway station. • Getting there from the Airport Travelling by train is the fastest way to get from the airport to the city center. The new Krakow Airport train station is located near the passenger terminal, at the rear of the multi-storey car park. Trains depart every half hour and bring you to the main railway station in just 17 minutes for only 8 zl (1,50 GBP). The usual cost of the taxi will be approximately 70 zl (14 GBP) but please set the price with the driver at the beginning. Please do not exchange all of your money at the airport because of unfavorable exchange rates. • Getting there by car Driving in the centre is really complicated so if you decide to come by car, use your GPS-navigation. The best way is to take the following route: Pasternik - Opolska - al. 29 Listopada - Warszawska (do not miss it the turn after the bridge over the railway!) - Basztowa - Westerplatte - left to Kopernika st. where you will find the gateway to the hotel parking. It is a secured parking where you can leave your car for the whole week for approximately 50zl/day (12 EUR, 10 GBP). Cheaper parkings are near the Airport, prices starts from 90 zl (19 GBP) per week. 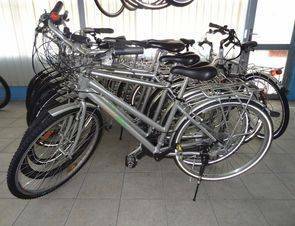 The Krakow and the Dunajec Path cycling holiday includes the daily transfer of luggage to the next hotel and local support if required.